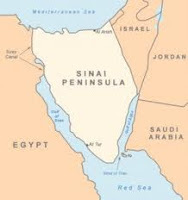 Regional analysts say Israeli officials are thinking about reoccupying the Sinai Peninsula because of the growing prospect of infiltration by al-Qaida and other militants such as Hamas, the inability of the Egyptian military to guarantee security and the prospect of a cut-off of vital natural gas supplies flowing through a repeatedly sabotaged pipeline, according to a report in Joseph Farah's G2 Bulletin. Israeli officials already have warned of a heightened terrorist threat from the Sinai. In April, Israeli aircraft attacked a car said to be carrying three Hamas operatives allegedly planning to abduct Israelis there. In response, Israel's counter-terrorism bureau issued an instruction that told of "updated information that terrorist organizations are continuing their efforts to abduct Israeli tourists in Egypt's Sinai Peninsula for bargaining purposes" and that "terror agents that are residing in Sinai are coordinating plans for such attacks with local Bedouin collaborators." Since the fall of Egyptian President Hosni Mubarak in January, Israel has become increasingly concerned with the security of the Sinai, a stretch of land that is three times the size of Israel's pre-1967 border area, or some 23,000 square miles. As G2Bulletin recently reported, some 400 al-Qaida militants are known to have infiltrated into the Sinai with the help of Hamas Palestinians from bordering Gaza. There also is Israeli concern that Hamas could bring in rockets from the Gaza Strip and shoot them into Israel along the 140-mile border between Israel and the Sinai. Egyptian authorities also claim they no longer can maintain security in the region. Egyptian police are abandoning their remote stations and checkpoints, which are coming under increased attacks from Bedouin tribesmen in the region. Bedouin tribesmen ransacked numerous abandoned government facilities and have threatened to attack South Sinai oil installations and tourist resorts. "The Sinai is already known as a lawless land," according to a senior Israeli official. "There is real concern that if the Egyptians don't get the Sinai back under their control, it could develop into a major threat to Israel."